As if America’s whiskey boom isn’t exciting enough, upstart distillery growth is driving incredible innovation in an industry long accustomed to making pretty similar tasting products. Some of the finest spirits from said smaller distillers I’ve had in the U.S. are being made in French Lick, Ind., at the Spirits of French Lick. About three years old, the distillery is an offshoot of the well-known (in these parts, anyway) French Lick Winery. If you’ve never made the short drive to visit this amazing little town, go there and try these spirits. Lee Sinclair Four Grain Bourbon by Spirits of French Lick. But to the real news. A pair of French Lick spirits are now trickling into the Louisville market: the Lee Sinclair Four Grain Bourbon (90 proof) and The Wheater (90 proof), also a bourbon (but instead of using traditional rye grain as its flavoring element, it uses wheat). These whiskeys are making their way to shelves first at large River City Distribution accounts such as Kroger, Target and Wal-Mart, then eventually at local restaurants and bars. I’ve had the good fortune of tasting these and several other spirits made by head distiller Alan Bishop, who learned the art and dark science of distilling at home, and refined that knowledge on a larger scale as an assistant distiller at Copper & Kings American Brandy Co. He took those spirits smarts a step further with a multi-still operation at French Lick, where he has created lines of vodka, rum, gin (his Old Tom expression is excellent), aquavit, eau de vie, bourbon and rye whiskey. These spirits are grain forward, accentuating the cereal grain source materials in ways large distilleries often don’t. Don’t get me wrong, I love big distillers’ whiskeys, but until you taste the grain nuance found in whiskeys such as those I’ve sipped at smaller distilleries like French Lick, Few Spirits (Chicago), Journeyman Distillery (Three Oaks, Mich.), Catoctin Creek (Purcellville, Va.), KO Distilling (Manassas, Va.), Copper Fox (Sperryville, Va.), Virginia Distilling Co. (Lovingston, Va.) and so many more, you’ll not understand what I mean. So keep an eye (and your wallet) out for the Lee Sinclair Four Grain and The Wheater Bourbons. Get them, and then drink them with adventurous spirits fans who will appreciate the noticeable differences. These are delicious sipping whiskeys, so have some good nibbles at hand (cured ham, chocolate, cheese, etc.) to elevate those flavors. 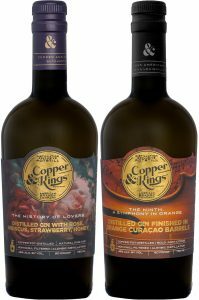 LOUISVILLE, Ky.–Copper & Kings American Brandy Co. announced the release of a pair of copper pot-distilled American luxury gins: The History Of Lovers (a rose bouquet-forward pink gin) and The Ninth (a bold, juicy, blood orange gin finished in Destillaré Orange Curaçao barrels). According to the release, The History Of Lovers ($35, 750ml) is a 90-proof gin distilled to retain the intense floral aromatics of rose flowers. Crushed whole juniper berries mixed with rose hips, rose water, honey, sweet orange, tangerine, lime and pink grapefruit peels, alongside jasmine and lavender petals, coriander, pink peppercorns and licorice root are macerated in apple brandy low-wine, then redistilled together with vapor distilled rose hips, pink grapefruit peels, and lavender in the gin basket. A flash post-distillation maceration of rose hips, hibiscus tincture and strawberry juice concentrate is added for color and perfume. Double distilled crushed whole juniper berries together with orange blossom honey and Seville bitter orange peels, sweet orange and grapefruit peels, coriander, cardamom, and grains of paradise are macerated in apple brandy low-wine, then redistilled together with vapor distilled Seville blood orange peels, sweet orange peels and jasmine in the gin basket. They are then finished in C&K Destillaré Intense Orange Curaçao barrels for added complexity and depth. The gins are recommended for refreshing gin & tonics, fresh, crisp spritzers, unique Negronis, and delicious cocktail smashes. Both are available across Copper & Kings national distribution footprint and at its Butchertown distillery. LOUISVILLE, Ky.–Bourbon Classic has announced additional details about its 2019 event, taking place February 20-23. The Thursday, Feb. 21, event SAVOR will be hosted at Peerless Distilling Company in downtown Louisville. Attendees will have a special evening with fourth and fifth generation operator/owners, Corky and Carson Taylor, and master distiller Caleb Kilburn learning about its storied history and what makes Peerless unique. Ticket holders can sample and vote on three specially chosen single barrel expressions and the winning barrel will be bottled and available for purchase at Peerless on Saturday, Feb. 23, as a Bourbon Classic Private Select. Friday’s Cocktail & Culinary Challenge showcases world class mixology with classic and contemporary bourbon cocktails paired with chefs’ bourbon-themed culinary complements. Each chef will use Kentucky Proud products as a main ingredient, focusing on foods cultivated here. 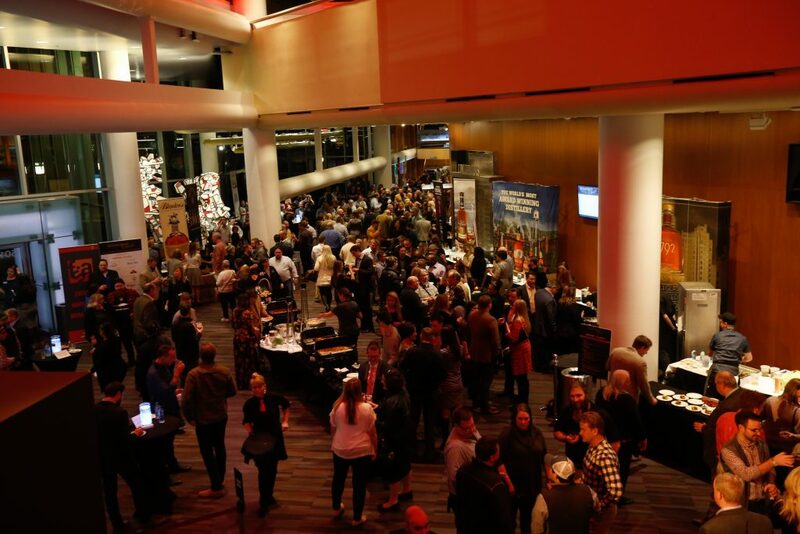 Attendees will have the opportunity to meet the contestants and hear them discuss their creations, chat with distillers and representatives about what makes the brands unique and enjoy a tasting portion of each cocktail and small plate. A select panel of media personalities and industry experts will evaluate the cocktails and small plates individually and as pairings and select winners for each category. 2019 Judges will include chef Robert Bleifer (vice president, Food Network), Sam Slaughter (food and drink editor, The Manual) and bartender Molly Wellmann (owner Myrtle’s Punch House and Japps Since 1879). Friday VIP ticket holders will enjoy exclusive access to the Amber Lounge, which features special bourbon tastings from Bulleit Frontier Whiskey, handcrafted ice from Kentucky Straight Ice, additional culinary offerings and comfortable seating. Saturday will kick off with Bourbon University, an opportunity to learn from industry experts through lively moderated discussions, demos and tastings. Sessions include a Michter’s Whiskey lineup pairing with smoked salmon, artisanal chocolate, spicy jerky, country ham, and delicate macaroons. Bourbon enthusiasts also have the opportunity to attend a session with Buffalo Trace Master Distiller Harlen Wheatley, who will showcase the distillery’s Experimental Whiskies. Saturday’s events will conclude with Bourbon Classic TASTE. Attendees will enjoy bourbon tastings from a wide array of distilleries, then meet distiller representatives and discuss what makes their products unique. 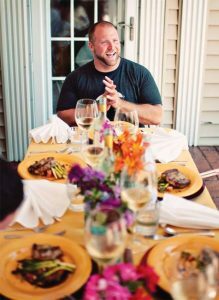 Small plates and cocktail tastings will be available in the TASTE KENTUCKY area showcasing authentic iconic Kentucky cuisine. Saturday VIP ticket holders will enjoy exclusive access to the Amber Lounge, which will feature special bourbon tastings from Buffalo Trace Distillery, specialty drinks from award-winning bartender Molly Wellmann, additional food options and comfortable seating. 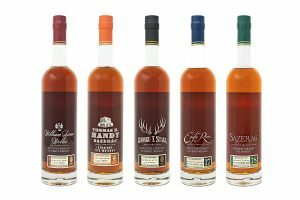 Tickets for the Feb. 22 and 23 Bourbon Classic events are available at BourbonClassic.com. Weekend packages are also available at a discounted rate. Tickets to the Feb. 20 event, Top Shelf, are sold out. 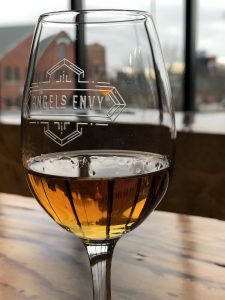 It hardly seems possible that Angel’s Envy’s new Oloroso Sherry Cask Finish is the brand’s first release in five years–at least until you remember that the distillery proper just turned 2 in November. So much happens in this world of whiskey between new releases, single barrels, collaborations and whatnot that the gap certainly missed my notice. I wouldn’t have held it against AE anyway. It’s doin’ its own thang rather well. 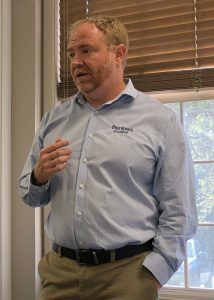 So it came as some surprise when Wes Henderson, AE cofounder and chief innovation officer, mentioned the five year drought. And, as he usually does, he anchored his statement in his wholly believable brandspeak: We’re small. We take our time. We don’t get in over our heads. We rush nothing. But since bourbon stories are rarely tasty without a little whimsy whisked in, Henderson and his two sons, Kyle (production manager) and Andrew (lead distiller) began the discussion of the Oloroso Sherry Cask Finish release by saying they’d nearly forgotten about those Olo barrels full of AE bourbon stacked in the back of the distillery. And when they rediscovered and thieved those barrels, the bourbon within was a magically different dram, a powerful and polished corn liquor kissed with customary sherry notes of raisins and nuts, and a silken mouthfeel. “I said, ‘Holy crap, this is exceptional!’” Kyle Henderson recalled. Frankly, I don’t care a wit whether this tale was made unnaturally tall in the way of Bourbon Marketing 101. This whiskey bears witness to the men’s claims. It is no ordinary bourbon. Nor will it be available in ordinary supply. This, the first of its new Cellar Collection, is a Kentucky-only release of just 3,600 bottles. That number, Kyle Henderson said, would have been 3,800 had his daddy not insisted on such oft-repeated sampling. NOSE: Bourbon leads with all its common goodness: fruit, rye, spice and oak. Surprisingly, the anticipated Sherry-esque notes of nuts, raisins and figs weren’t there (more on that shortly). PALATE: Again, bourbon up front, with nuances giving chase: hazelnut, white grape, au de vie, graham cracker, vanilla and some white pepper announcing its proof: a tingly 100. The mouthfeel begins as lush and lubricious before drying nicely on the finish. OVERALL: This is a sophisticated whiskey that’s made for sipping solo. Sure, it becomes even more silken with a bit of water, but its nuances are muted in the process. I see no need for ice. Ever. But in the hands of a great mixologist, I’m thinking miracles could happen. Back to the nose … Since our tour and tasting ended early, we were offered another pour while we awaited lunch. This time the sherry influences leapt out of the glass: nuts, raisins and floral notes up front with vanilla and brown sugar bringing up the rear. Without my asking, two others in the group echoed my “second pour” experience. One even had the presence of mind to ask how long the first pour sat before we tried it. When told it was around 30 minutes, we decided (rightly or wrongly) that the rest likely let the sherry notes escape. BUY OR BYPASS: If you’re an Angel’s Envy fan willing to spend $199 on the newest model, you’ll not regret it. It’s a terrific and beautifully finessed bourbon, a worthy member of this distillery’s unique lineup. If you’re a collector hunting for a truly hard-to-find bottle to pour for cherished friends or save for a child’s wedding day, all will love you for it. And with such a small release, it’s likely they’ll never have had it. In an industry where so much great whiskey can be found for a fraction of this sticker, it can seem like a lot to pay. So, at the worst, buy a pour if you find it on a bar. But in a time when people spend hundreds and thousands of dollars on whiskey that–to my palate, anyway–isn’t as delicious as this, it’s arguably not so spendy. BUYER’S INFO: There are two ways you can attempt to get a bottle of this: Members of Angel’s Envy’s 500 Main Club were offered early reservations for a chance to land one come February 12. If you’re in the club, you’re one of a reported 5,000 members. So do the math on your odds to get a portion of the Club’s allotment. Come February 15, the remainder of the allotment will be released at the distillery and at select Kentucky retailers. Even at $199 per bottle, I can’t imagine this will last long (but I’ve been wrong before). It took much of my life to fall in love with bourbon, but my courtship with rye was a one-and-done event. I fell for it from the start: its lighter body, fruity roundness and tingly, busy edges sharpened further by pepper and herbs. Good rye is a boss in cocktails, an attention-commanding star of the show without being a diva. It plays well with other ingredients while ever reminding the drinker that it’s the reason you chose this spirit. 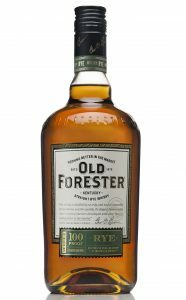 That Old Forester, one of my favorite bourbon producers, is releasing a 100-proof rye in February, is about as good as news gets in cold and dreary January. That this is the distillery’s first new grain recipe in 150 years proves change happens slow at Fo’. But at least it’s a change that pleases me and surely many others. I do like Woodford Rye, but I love this Old Forester Rye. Nose: So-Fo’ that you could easily mistake it for its legendary bourbon sibling if you didn’t know it was rye. Peach pie, ripe banana, dried grass, warm brown sugar bloom from the glass. Flavor: A rush of fruit and spice that’s delicate for 100 proof. Rye leads, followed by toasted oak, spearmint and cooked green apple. Tangy toasted oak and pie crust boom on the exhale. Subsequent pours releases dill and more graham cracker. Finish: Long and soft. Wait a few minutes for aftertastes of mint-milk chocolate and, yes, more graham cracker. The more you drink it neat, the drier it gets, but not unpleasantly so. Amid the tannin, pleasant floral notes emerge to offset it. Conclusion: Gosh this is good, really good! For years I’ve praised Old Forester’s 100 proof bourbon as one of the best whiskey bargains on the market. That Brown-Forman master distiller Chris Morris has created a rye sibling at a similar price and at such quality is exciting though not surprising. If you’re an Old Fo’ fan, you’ll recognize its sibling’s DNA at every level. Pizza Lupo partner and pizzaiolo Max Balliet stands in his dining room wondering aloud whether to obtain the Vera Pizza Napoletana (VPN) certification for his young Butchertown pizzeria. After all, he claims to serve Neapolitan pizza, so what better way to assure guests they’re getting a version that’s as close to that served in Naples, Italy, right? He’s telling the truth: It’s not worth it; and Pizza Lupo does make fantastic pizza. Balliet makes pizza masterfully. Along with MozzaPi, Pizza Lupo’s pies are the finest renditions of Neapolitan pizza in Louisville. (Balliet even credits MozzaPi co-owner Tom Edwards with offering advice on dough and technique.) The crust is feather light, nearly paper thin, yeasty-aromatic and flavorfully scarred (“leoparded” is how it’s described in the industry) by the black marks of the wood-fired oven’s intense heat. A Neapolitan-style dough’s moisture content is so high and its gluten network stretched so thin that the rapid exodus of steam from within keeps it microscopically (and mostly) floating above the 900 F pizza stone. The black spots are the only evidence that it’s lingered there for about 90 seconds, which is all the time it takes to bake one of these 12-inch beauties. The leoparded crust edges develop when the pizza maker moves the pie near the wood fire or up into the oven’s dome, where even the Devil won’t hang. I and two colleagues shared the Margherita ($12, tomato, basil, fresh mozzarella) and the Sting Like a Bee ($15, tomato, fresh mozzarella, soppressata and spiced local honey) for lunch, and both were fabulous. Their sizes are ideal for sharing with another, but were one’s stomach fully on “E,” it would be possible to consume one solo. It was a midday working meal, so no cocktails were had, so the bar (according to friends and some lavish social media praise) will be revisited later. Great place to get an Amaro flight if that interests you. The space itself is remarkably balanced between modern-refurbished and appropriately industrial for the neighborhood; plus, it’s completely casual. Located just north of Mellwood Ave. on Frankfort Ave., it’s ideally done for the century-plus old building in which it’s housed. It’s also a welcome addition to Butchertown, whose restaurant offerings are limited but really good. Lunch hours are Friday-Saturday, 11 a.m. to 2 p.m.; dinner hours, Tuesday-Saturday, 5-11 p.m. Call 409-8440 for more info. LOUISVILLE, Ky.—The Kentucky Bourbon Hall of Fame will induct three individuals into its hallowed ranks on Friday, Sept. 14, and bestow its prestigious Parker Beam Lifetime Achievement Award on one of the industry’s most successful leaders, visionaries and champions. “This year’s class truly shows the diversity of personas behind the growing Golden Age of Kentucky Bourbon, from a beloved tour guide whose wisdom and personality embodies and elevates our visitors’ experience, to the leadership and passion of three top executives who have forged the path to our current success,” Eric Gregory, president of the Kentucky Distillers’ Association, said in a news release. LAWRENCEBURG, Ky.—Each year Four Roses releases a Limited Edition Small Batch bourbon, and that tradition will continue this year when it hits shelves two Saturdays from now. If you’re not a bourbon wonk, know that this is a high-demand item whose $140 MSRP will likely not be seen outside its distillery gift shop sales. Expect retail prices to be jacked way up; secondary costs to triple or more. But since you haven’t tasted it and I have (review forthcoming), I can tell you this much: Get one if you can. It might be my favorite Four Roses release ever, and that’s saying a lot given last year’s remarkable Al Young 50th Anniversary release. The LESB will be available in limited quantities at the Four Roses Distillery Visitor Center in Lawrenceburg, Ky., and its Warehouse & Bottling Facility Visitor Center in Coxs Creek on Saturday, Sept. 15 beginning at 9 a.m. It will then roll out to additional select retailers in the weeks following. I don’t know what the policy is for lines forming early outside for these events, but I once met a man in line who’d driven from Michigan, arrived at 4 a.m. and waited in line all morning. Wouldn’t surprise me to see some tent dwellers show up. The distillery is using the bottle’s release to toast its 130th anniversary, an incredible milestone for a brand that’s weathered some tough ups and downs. According to a news release, four of Four Roses’ unique Bourbon recipes were selected for this bottling. This bottle will feature a 10-year-old Bourbon from the OBSV recipe, a 13-year-old OBSF, 14-year-old OESV and 16-year-old OESK. This morning, Elliott led a small group of reporters through a tasting of each of the four bourbons in the batch, followed by the finished mingling. It was an extraordinary look into how the LESB is crafted. Bottled at barrel strength, 108.3 proof, the 130th Anniversary LESB offers rich vanilla, raspberries and ripe berries, and crème brulee on the nose. As it hits the palate, it opens into flavors of apricot, mint, cinnamon, apple and mellow oak. This Bourbon boasts a very long finish, with hints of cinnamon, more fruit and vanilla. Trust me, this is a short list of the flavors you’ll find in this bottle. I got many of those plus others. 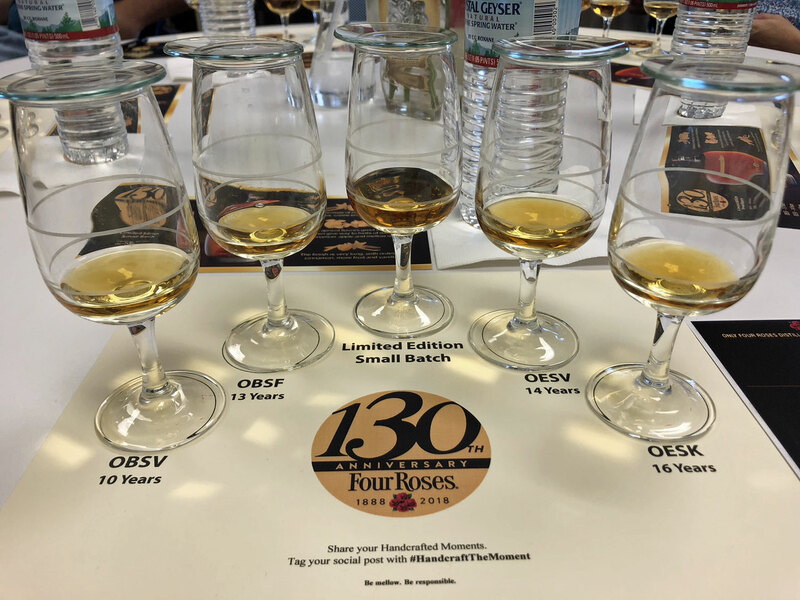 Four Roses will distribute approximately 13,140 hand-numbered bottles, which is a sizeable increase over recent years’ releases. So your chances of getting one have improved.